“Departures” won the Academy Award for Best Foreign Film of 2008. Seldom in recent times have I seen a movie that exudes such rare grace, dignity and poignancy as this movie. Every frame has a sort of meditative quality. The theme of this film is very original. It is the gentle tale about a quiet man in conflict with his world, his father and himself. 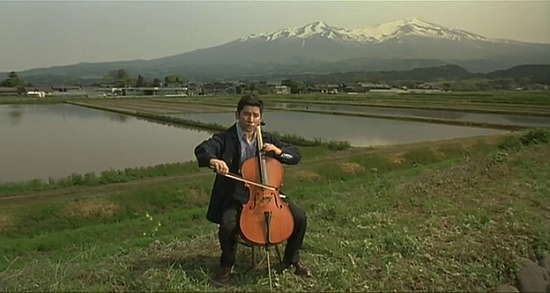 Kobayashi (Masahiro Motoki), a young man, loses his job as a cellist in a Tokyo orchestra that had recently dissolved. His wife, Mika (Ryoko Hirosue), agrees to move with him to a house in his northern Japan hometown. He desperately wants to find a new job so that he can continue to support her. Soon enough he, applies to a job ad that reads “Working with departures” and assumes that he’s applying for work at a travel agency. Upon his arrival at the workplace, he learns that it’s actually a job as an “encoffiner”, where his tasks include preparing dead bodies for burials. His boss, Ikuei (Tsutomu Yamazaki), convinces him to take the job despite that it doesn’t sound too appealing or worth telling Mika about. On his first day, he is made to act as a corpse in a DVD explaining the procedure. This follows his first assignment which is to clean, dress and apply cosmetics to the body of an aged woman who has died alone at home, remaining undiscovered for two weeks. He is beset with nausea, and humiliated when strangers on the bus detect an unsavory scent. He goes to an old public bath that he often went to during his childhood to wash off. The bath is run by Tsuyako Yamashita, whose son was an old classmate of Daigo. Daigo completes a number of assignments and the more he immerses himself in that line of work, the more he finds a way to appreciate his job while learning all the nitty-gritty details of how to prepare the corpses aesthetically. He experiences the gratitude of those left behind, gaining a sense of fulfillment. It is an incredible ceremony to witness as the encoffiner handles the corpse with the utmost reverence, care, precision. The nobility and grandeur of this job is not associated with any religion, though the idea "Death is a gate for another world" may be based on Buddhism belief, and is directly connected to dealing with human beings. Meanwhile, Mika finds the DVD D in TV and begs him to give up such a "disgusting profession." Daigo refuses to quit, so she leaves. Even Yamashita, his old classmate, tells him to get "a proper job." After a few months, Mika returns, announcing that she is pregnant. She seems to assume that he will get a different job. 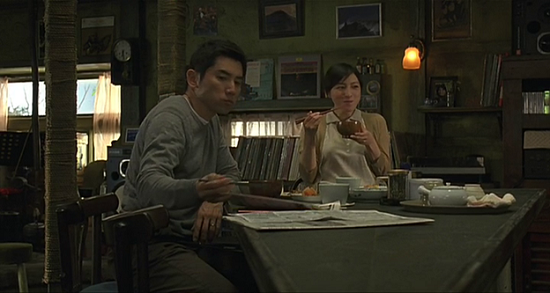 While Daigo and Mika try to work things out, the telephone rings with the news that Tsuyako, Yamashita's mother, has died. In front of Yamashita, his family and Mika, Daigo prepares her body. The ritual earns the respect of all present including his wife Mika. During cremation, Tsuyako's friend appears as the cremator. He thinks that death is not the "end" but the "gate to a next stage". Afterwards, Daigo goes to the river and finds a small stone to give to Mika. He tells her about "stone-letters", a story told to him by his father – "A long time ago, before words were invented, people would give each other stones to express how they were feeling at that point. A smooth stone might mean that you are happy, while a rough one might mean you are worried about them." Many years ago, Daigo had stood on these same riverbanks with his father and exchanged stone-letters. Daigo's father had promised to send him one every year, though he never did. Adapted from Shinmon Aoki's novel Coffinman, "Departures" deals with universal themes by deftly showing how the Japanese deal with death. Reminiscent of Kurosawa's deeply moving Ikiru, the characters here anticipate death and accept its inevitability and show great respect for the departed. Japanese "encoffinment" is a carefully choreographed ceremony that gently prepares the deceased for burial, and more importantly allows mourners to adjust to the transition and lovingly say "goodbye" to them. At some point in the film, Daigo rediscovers his innate passion for playing the cello and becomes inspired to try reconnecting with his estranged father. The development of characters is done with plenty of grace and sensitivity. There are many intricate details throughout the film that become more important later on, so it’s very important to pay close attention to everything. The strong performances all across the board help you to feel fully engrossed from start to finish while the messages about coming to terms with death and embracing life will make you feel alive and gently uplifted. Director Yojiro Takita includes superb cinematography, pacing and music score which help to enrich the film without hitting you over the head. It’s the kind of film that finds just the right balance between entertaining the audience, provoking them intellectually as well as emotionally. In summary, "Departures" is a tremendously moving experience filled with warmth, wisdom, intelligence and tenderness sprinkled with just the right dash of humor to balance the heaviness and keeps you thoroughly enthralled.